Wildlife macro images from the Natural World of our smaller inhabitants. This Gallery is for the Order known as Diptera or true flies. True flies have only two wings and there are about 1 million species worldwide of which about 150 00 have been described. This is an image of the Drone-fly (Eristalis tenax) or flower fly as it is known in America. Here it is cleaning its feet (tarsi) whilst visiting one of the many compositae flowers (daisy like flowers). It belongs to the Class Insecta, Order Diptera, Family Syrphidae, Genus Eristalis and Subgenus Eristalis. These flies belong to a group of flies collectively known as the ‘Hoverflies’. It is often mistakenly reported that the hoverflies fall under the subfamily Syrphidae. This is only partly true i.e. 1/3 true as only 1/3 of the hoverflies in the UK is covered by the Syrphidae. The other 2/3 are in fact covered by the subfamily Milesiinae. The Syrphidae are distinct from the Milesiinae by the fact that Syrphidae larvae are predatory. Many hoverflies show a form of mimicry known as Batesian mimicry i.e. resemble species such as wasps that are dangerous and exhibit warning colours to advise predators of such. Hence the hoverfly gains some level of protection by looking like a wasp without having to invest in a defence such as a sting. In this case the Drone-fly is a mimic of the drone hive bee and even has evolved its flight to be similar to that of the bee over other hoverflies. The larvae also have the nickname rat-tailed maggot and live in organically polluted waters such as run-off from dung and silage heaps. The female drone-fly will hibernate in any suitable outdoor crevice including barns, sheds and houses and will emerge on warm days during the winter and spring. Consequently this hoverfly is often reported all year round. It is also one of the most widely distributed hoverflies occurring on every continent except Antarctica. This fly is harmless and is an important pollinator in its own right. 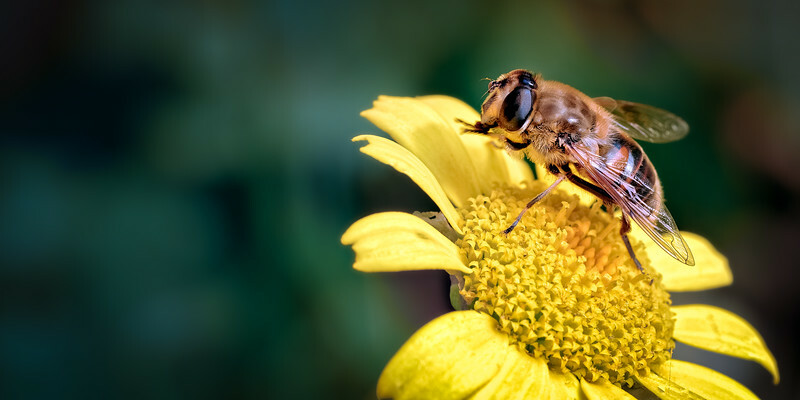 There are about 6 000 species of hoverfly worldwide.